I am in love with the backsplash. Can you give me some details on it? Is it tile? Where can I find something like it? This kitchen is AMAZING! Click "more info" under pic to read all Qs & As.....lots of info. Can anyone confirm the actual brand and style of floors? Can someone tell me the color of the cabinetry?? could you please tell us the dimensions of the islands please? What is the granite? Beautiful! - White and bright! emandsteve we are not familiar with that area. Very similar....and actually may be "Lennon" or "Blanco Antico" because I'm shopping / considering for my countertop. Hope this helps. What is the name of this granite? - Granite? the link doesn't say what the name of the granite is? And this is not calcutta marble, that is the first picture on the above link. I am pretty sure Delicatus and the Bianco Antico are pretty much the same thing or should I say you can't really tell them apart. Can anyone tell me the wallpaper name/company? Also, confirm the granite....love it! Can you tell me what marble was used for the backsplash? Very unique! Please tell me what the name or color of the marble for the black splash is. Also the color of the wallpaper. I can't tell if it is black or blue. The kitchen is timeless! does anyone know the name of this granite? what brand of cabinets are these? ...just what I'm looking for! Is this Delicatus granite? if so is there a certain color or it? I've seen many different versions and they all look more gold...love this one!! Cabinet colour and glaze please? Lights - What is the brand and style of lights over the island. Sharon - What type of granite is this I love it! Delicatus granite can change a lot from slab to slab, but it's always available. You can also look for Ice Brown Granite and Alaska White Granite for a similar look. Lighting - Can you please tell me the brand of lights over the island and table? Checked their site and they are not there. Maybe they are from another manufacturer. Cabinets - What brand, color and style are these cabinets? 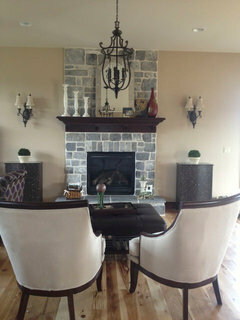 These were custom cabinets, everything from the door profile to color was specified. However, you can find a nice alternative with Woodmode Cabinetry. Are the cabinets white or ivory? Backsplash heaven - Would you kind telling me about the backsplash and where I can get it? They are a custom paint and glaze. However, Woodmode has something similar. I love the wrought iron lighting with all the white. It looks beautiful with the grain of the granite. Well done! Those were the homeowners. She has gorgeous pieces. I will ask her. Granite - What is the name of this granite? Type of granite - What is the name of this granite? wow, this is what I want, white and bright this is truly gorgeous, love it! window manufactuer-height and width please? casements? where is the dining table from? Thank you. The table is from Arhaus. Would you know the manufacturer of the light fixtures? kohler sink color - What color kohler sink is this? kitchen sink color - Can anyone tell me the color sink that's used in this kitchen? Island Dimensions - Can you tell me the dimentions on the islands? what color paint is used on cabinets? Is it glazed? What brand/style/color are these cabinets? - Also, are they glazed? Pendents - What is the brand of the pendents? Backsplash - Where did you get the backsplash? What is the name of this granite?? - What is the name of this granite?? 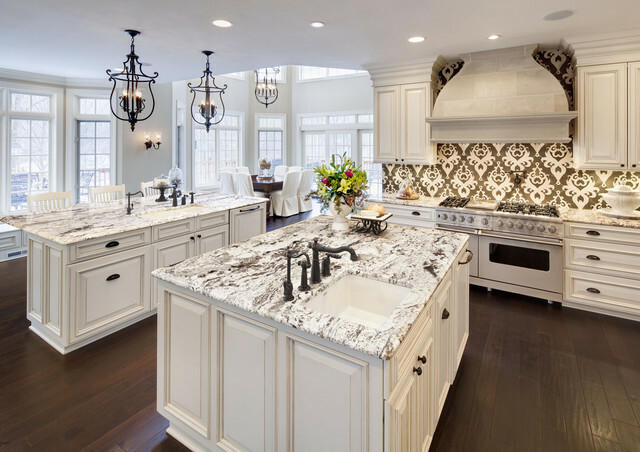 Delicatus Granite - My kitchen cabinets are white; I'm looking at purchasing the Delicatus granite for the countertops; walls cream. Would this look good? Suggestion for backsplash? I love this kitchen! Gorgeous !! - What is the color of the cabinets? Gad Cohen - Name of granite, honed or polished? Love the faucet. What kind is it? - What kind of faucet is this? Lighting - Where can I find the pendant lights and chandelier? Can you advise the color of paint on the walls please? Cabinets - What are the brand of cabinets you used here? Cabinet color - Are these cabinets white or off white? Backsplash - What is behind the stovetop??? Beautiful! Could you please tell me the size of each island? - I would like to know the size of each island, please. Cabinet color - Is this color a white, white or a cream? Where do you find the lights? Cabinet color - Love this coloring....is there a glazing? what is color? Sink - What material is the sink and who makes it? Love the walls color! What color is it? - Love the walls color! What color is it? height and width of transoms? thank you! Are these casement windows? who is the manufacturer? Thank you in advance. Love the wall paint color! Do you mind sharing it with us? Lovely kitchen and eat in space. what edge is on the granite? You have to respect that backsplash job. That is big time. Gorgeous kitchen. Honed granite or polished? I can't tell from the picture. Thanks! Do you have more pictures? - Is there another view of the kitchen so we can see what it off further to the right side? lights above center island - do you know where the lights came from above this center island? Thank you. Do u know the manufacturer of the small pendants in the kitchen as well as the large one above the table? They are beautiful! Granite countertops and wood floors are what to look for if you want to make a large purchase that will have a low-maintenance cost. Hassle-free & attractive features are what YOU need in your future home!